Prosperity (Prosperity #1; Riptide Publishing) was the first book I tried by Alexis Hall. I was drawn by the steampunk and romance elements as well as the promise of new territory. Discovering new-to-me authors is fun and I also relished the idea of expanding my steampunk/steampunk romance boundaries. In that sense, Prosperity definitely delivered. A breathtaking tale of passion and adventure in the untamed skies! Prosperity, 1863: a lawless skytown where varlets, chancers, and ne’er-do-wells risk everything to chase a fortune in the clouds, and where a Gaslight guttersnipe named Piccadilly is about to cheat the wrong man. This mistake will endanger his life . . . and his heart. Thrill! As our hero battles dreadful kraken above Prosperity. Gasp! As the miracles of clockwork engineering allow a dead man to wreak his vengeance upon the living. Marvel! At the aerial escapades of the aethership, Shadowless. Beware! The licentious and unchristian example set by the opium-addled navigatress, Miss Grey. Disapprove Strongly! Of the utter moral iniquity of the dastardly crime prince, Milord. Swoon! At the dashing skycaptain, Byron Kae. Swoon Again! At the tormented clergyman, Ruben Crowe. Because this was my first taste of Alexis Hall’s work, I went into the story expecting everything and nothing. In other words, I adjusted my expectations as needed because it’s not clear from the blurb how much romance to expect. I tend to veer toward steampunk romance, but romantic steampunk works plenty fine for me as well. That said, Prosperity takes an altogether different direction, but not an entirely unexpected one. I compiled a few of my impressions about the story in a few non-spoiler tags so you can learn more about it! * Prosperity takes place in a Victorian, Weird West flavored steampunk world. * Prosperity has a unique writing style (for steampunk/steampunk romance books, at any rate) in that it’s written in cant. Plus, it’s first person POV so we get deep inside Piccadilly’s head. For some readers the stylistic language will create a learning curve. However, if you’re used to cant and/or enjoy that kind of challenge, many beautiful passages await you! * Prosperity is best approached as steampunk with romantic elements. The ending is upbeat and characters have deep, complicated feelings for each other, which makes the story more about how complicated love is than a specific romance. * The story reads as a “day in the life” of the main character, the charming Piccadilly. Prosperity is more character-driven than plot driven. 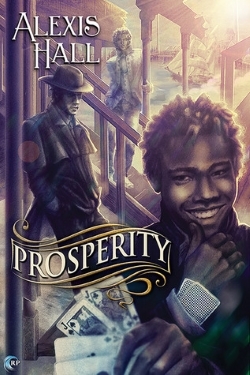 * Prosperity features an ensemble cast of truly diverse characters (e.g., POC hero, a variety of queer characters). One of its standout elements! * Steampunk elements include a floating city, aetherships, aethermancers, cyborgs, and weapons. Prosperity isn’t just one story—there’s a whole world to explore. The series includes two other books: Liberty & Other Stories and There Will Be Phlogiston (available for free at Amazon US) as of this writing). Read this post at Alexis Hall’s site to learn more about the “Prosperityverse.” If you decide to take the plunge, I hope you enjoy the discovery! Heather Massey is a lifelong fan of science fiction romance. She searches for sci-fi romance adventures and blogs about them at Galaxy Express 2.0 and Sci-Fi Romance Quarterly, where she’s the Releases Editor. She’s also an author in the genre. To learn more about her published work, visit heathermassey.com.